The most common shingles used in house roofs are made up of asphalt. This is so because asphalt roves to be a strong and durable material. Apart from asphalt there are a lot many types of shingles that are used for making roofs. But the asphalt shingles are the most common ones. Asphalt shingles are easy to install. They are also available in low price. This is the reason why asphalt shingle is the most popular kind of shingles that are used in making roofs. Asphalt shingles are of many types. They are available in different colors as well. Shingles are a great and popular roofing option. The types of asphalt shingles are basically differentiated with the difference in their base material. There are two types of base materials that are used in making asphalt shingles. One is the organic base and the other one is the Fiberglass base. Both these types of shingles are made up of using asphalt or modified asphalt. This asphalt is applied on both the sides of the shingles mixed up with different granular material. The granular material which is on the upper side of the shingle (which is exposed to the sky) include slate, quartz, schist, stone, vitrified brick and last but not the least ceramic granules. Any of this mentioned material is used with asphalt for the upper side of the asphalt shingle. They are used on the upper surface of the shingle to prevent the ultra violet rays to damage the roof shingles. They also provide a good show to the shingles providing them physical protection and also enhancing its appearance. Some shingles are also covered with copper or other materials on the upper surfaces to prevent algae growing on it. The material which is used for the back side of the shingle (the one which is fixed on the roof) includes sand, mica or talc. The back side of a shingle is treated with this material to prevent them from sticking on to each other, before they are used on the roof. The mostly used shingles are the three-tab shingles. They are also called strip shingles. These shingles are economical. As their name suggest they are called three tabs because they are cut out in the forms of rectangular tabs. It is hard to decide which ones are the best asphalt shingles. Asphalt shingles price is also one such cause of concern. Fiberglass shingles consist of a fiberglass mat which is used for the reinforcement purposes of a shingle. This mat uses formaldehyde resin and then it is coated with asphalt mixture. This asphalt mixture consists of chemical fillers which help the asphalt to get fixed with the mat of the shingle. This enables the shingle to prevent from breaking or tearing apart. There are different kinds of shingles. 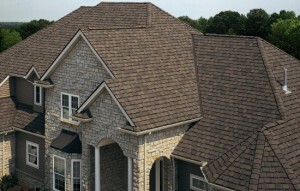 Fiberglass, asphalt, composition shingle is all types of the shingles that are used for making roofs. It is very difficult to judge and decide which asphalt shingles will last the longest. Different climatic conditions also play a very important role in determining which shingle will last longest in which climatic conditions. We have discussed about the basic and various types of asphalt shingles. We have also discussed about the distinguishing factor between types of asphalt shingles and three tab shingles and composition shingles. Keeping in mind these points you can easily choose and install the beast asphalt and fiberglass shingles as per your requirements.